Kyowa Shipping, a leading company of the ocean transportation in the islands of Pacific Ocean, has provided liner shipping service for more than 40 years. In recent years, we are expanding the reefer transport business. 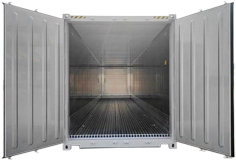 We can offer reefer service which can maintain cargo at -40℃(THERMO KING Magnum Plus) or -60℃(THERMO KING SuperFreezer) while temperature can be controlled ranging from -25℃ to 25℃ by ordinary reefer units. As a pioneer in the carriage of Reefer container in the region, we keep on sailing to better support customer needs. and it affects the unit.